They met in secret, away from their white coaches and teammates. "We used to meet at midnight," former Syracuse football player Dana Harrell says. "And we could have met earlier. But we used to meet at midnight, to lay out our thoughts and plans, just like the slaves." Harrell was one of nine college football players the international media would — incorrectly — call the "Syracuse 8." It was the late 1960s, after the assassinations of Martin Luther King Jr., Malcolm X and Bobby Kennedy. Dana and his black teammates didn’t just see racial injustice. They lived it. And they wanted to do something about it. The Syracuse 8 held some of their secret meetings on campus. But whenever they were hungry, they went to Ben’s Kitchen. They were all working-class kids from inner cities. And they talked about their plans over plates of barbecue chicken, collard greens and cornbread — among the prostitutes and hustlers and the nightly craps game. "For the people of color in the city, that was the place, that was the joint," says Abdullah Alif Muhammad, Dana's teammate, who back then was known as Al Newton. "When all the other places closed, there's a place where you would go to get something to eat." "And trust me there were no spies or infiltrators there," Dana says. At the time, Syracuse was a nationally prominent football program. Dana and his teammates had inherited the proud legacy of Jim Brown, one of the greatest football players of all time, and Ernie Davis, who became the first African-American to win the Heisman Trophy in 1961. Throughout the 1960s, Syracuse rode a wave of success, appearing in bowl games and filling the rosters of NFL teams. But the Syracuse 8 were considering something that would put their NFL careers in jeopardy: a boycott. And let’s be clear about this: They all wanted to play. None of them had signed their letters of intent to Syracuse expecting to sit out. But there was a lot about their Syracuse experience they didn’t anticipate. It was a short ride from the airport to the university, but that’s all it took to educate running back Greg Allen about the realities of being a black football player at Syracuse. Greg was driven to campus by the coach who recruited him. "It was a little bit of a shock for me, because I knew that I had traveled north of the Mason-Dixon Line not below it." "They wouldn't allow me to take a calculus course, a math course, because it was during football practice," he says. "And the only option was to take the calculus honors class. And the assumption was, 'You're a football player, what are you doing over here?' And I felt, kind of, insulted. And it was, kind of, like, you know, they wanted me to take general reading classes and general education classes. And it was, like, 'Wait a minute — no, no, no, no, no, no. I didn't come here for that.' "
"It’s dehumanizing. My talents, my own personal desires and wishes and goals and dreams, take a back seat to this thing called race or racism." Greg Allen was told he couldn’t be a biology major because he wouldn’t have time for labs. But he says that policy didn’t apply to white players. So, the Syracuse 8 drafted a petition asking the administration to give black and white players the same access to tutors and academic advisers. But most of the requests the group hashed out at Ben’s Kitchen would benefit both black and white players. Take the team doctor: "Our medical doctor for our football team was a gynecologist by training," Greg says. Alif says the recommendation for every injury was ice and rest. More than that, Greg says the doctor was hesitant to touch black bodies. "You know, there were two sets of latex gloves. And anything that could be avoided, was avoided. You're at a major university, and at the time one of the best football programs in the country, and you don't think enough of your players to get them expert medical care." The next item on the list had to do with playing time. The big southern schools still weren’t integrated. They wouldn’t play against teams with black players. 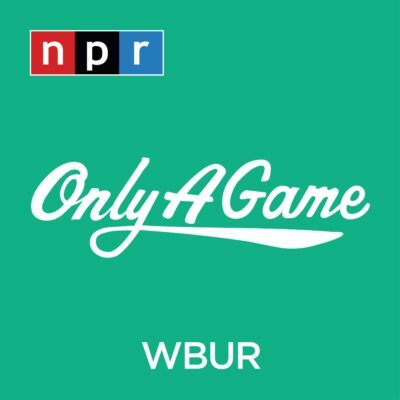 And Dana says, north of the "Cotton Curtain," schools followed unofficial rules about how many black players could be on the field at the same time. Even at home games. "You could have three outstanding halfbacks, but you wouldn't play them all together, because you didn't want the 'big money boosters' — that's what I call them — the big money boosters to accuse the program of going black," he says. "It’s dehumanizing," Greg says. "My talents, my own personal desires and wishes and goals and dreams, take a back seat to this thing called race or racism." The players felt if the team had a black assistant coach, many of these issues would go away. But by the spring of 1970, they’d been asking their coaches to hire a black assistant for a year. It hadn’t happened. Meanwhile, Greg Allen attended a meeting where a group of students and university leaders discussed starting a black studies program at Syracuse. A couple days later, he got a call to meet with head football coach Ben Schwartzwalder. "So I walked into the coach’s office, and I sat down, and he peered at me over his glasses," Greg says, "and he looked at me and he said, 'What's this I hear about you and this black crap?' "
Greg started to explain his position, but he says the coach really wasn’t really listening. "So he looks me in the eye, and he said, 'Well then, you have a decision to make. You can't be black and be a football player.' Of course, I was a little taken back. I said, 'Well, coach, you know, I'm going to be black all my life. I'm only going to be a football player for a short period of time, but I don't see how one would interfere with the other.' "
These were the issues Alif and Dana and Greg and the other black players talked about when they met at Ben’s Kitchen. By the way, Greg liked it there, too. "Great soul food, so yeah, it was a good place," he says. For Greg and his teammates, Syracuse University was also a good place. There was no sense in transferring. They felt no other school would have been better or worse. So "we decided to stay and fight for the soul of this great university," Dana says. As spring approached, the players decided to appeal to the coach one more time. If they didn’t see substantial efforts to address their grievances, they’d walk out of spring practice. Not a game or an alumni event — nothing that would put the program at risk. Just spring practice. "When we found out that, you know, the coach really wasn't going to meet our requests, we didn't show up for practice the next day," Greg says. "We knew if we had someone leak it to the press, that we would get the attention that we thought we deserved." The players got that attention, but they soon discovered that they weren’t in control of the narrative. The media seized on one of their requests in particular — that the school hire a black assistant coach. The other demands, the ones that would benefit everyone, they were forgotten. Greg says the papers labeled the Syracuse 8 as "black dissidents" or "black militants" or sometimes just "the blacks." "We were never asked any questions, or the media never contacted us to get any of our opinions," Greg says. "No one was really interested in our perspective." The nine members of the Syracuse 8 were suspended from the team. Some of their white teammates threatened to boycott if the black players were allowed back. Soon, Dana says, the chancellor’s office was flooded with letters from alumni. "'We want them off the team, we want their scholarships revoked,'" Dana recalls. "Some of them wanted us out of Syracuse University. They called us everything except a child of God, by the way. And they would put under their signature how much they contribute every year." "Some of the fans threatened to boycott the games if we were ever allowed to come back. Where have we heard that before?" Dana asks. He’s referring to Colin Kaepernick. And like Colin Kaepernick, the Syracuse 8 had a lot to lose. Each was the first member of his family to go to college. And each was now risking his scholarship to stand up for what he believed in. Once the story hit the papers, Dana Harrell got a call from his father. "Well, the conversation went like this: I went on like a 19-, 20-year-old young person would do about — you know, because everything's so clear when you're 19 and 20 years old," Dana says. "About what was right and what was wrong and what I felt I had to do. And he let me get it all out. And he said to me, 'Dana, when you're 40 years old and have a family and a mortgage and things you want to do for them, you're going to need that college degree.' Click." The players went home for the summer, not knowing what would come of their protest. Would they be allowed back on the team? Would they lose their scholarships? Over the summer, Jim Brown stepped into help, acting as an intermediary between the players and coach Schwartzwalder. But, on orders from the chancellor, Schwartzwalder did try to find a black assistant coach. As Alif remembered it, Jake Gaither, the head coach at Florida A&M, told him, "'You know, you guys don’t need a coach. You need a Martin Luther King. Who do you think’s gonna step into that?' "
Alif continued: "There's a lot of coaches that turned that job down. They knew the deal and they didn't want to step into that." When Alif returned to Syracuse in the fall, a black assistant coach had been hired, but Alif says, "He was not on the program listed as a coach. I remember going to a meeting, and the coaches were meeting with a blackboard with X's and O's, and he's sitting in the back of the room with his head down on the desk like he was sleeping. You talk about something that was hurtful. I mean it was like, 'Wait a minute. I sacrificed a career?' I felt deeply, deeply hurt." The Syracuse 8 decided to continue their boycott. They sat out the whole season. And the chancellor and a group of faculty members made their own stand: The Syracuse 8 would keep their scholarships. They would be allowed to graduate. "I turned that Type A focus from sports to academics, and it worked," Dana says. "But you sit there squirming on Sunday afternoon watching guys you played with and against. And you know they're still having fun. And it takes a while to get it out of your system." Of the nine, eight graduated from Syracuse University. Four went on to earn master’s degrees. Dana Harrell went to law school. Another player completed the coursework for a Ph.D., but never finished his dissertation. With the faculty and the chancellor on their side, the Syracuse 8 started seeing changes at the school. But while their academic careers took off, their football careers stalled. After his sophomore season, Greg Allen was contacted by scouts from every NFL team. Greg played his senior year at Syracuse, but he didn’t hear from a single NFL scout. He ended up in Canada, playing for the CFL. And that’s when he discovered how far the influence of the NFL reached. "One day I was asked to come into the coach's office," Greg says, "and [the coach] says, 'Greg, we're gonna have to let you go.' And I said, 'Let me go? What are you talking about, coach? I'm doing well here, you know. You said I was the best athlete in camp.' He said, 'Yeah, but you have a little bit too much baggage for us.' "
Even in that moment, Greg didn't regret his decision to boycott. "It was pure anger," Greg says. "I was angry that I had to go through this only because I decided that institutional racism had no place at Syracuse University or any place else in this world." The nine members of the Syracuse 8 moved on with their lives. They raised their families and launched successful careers. 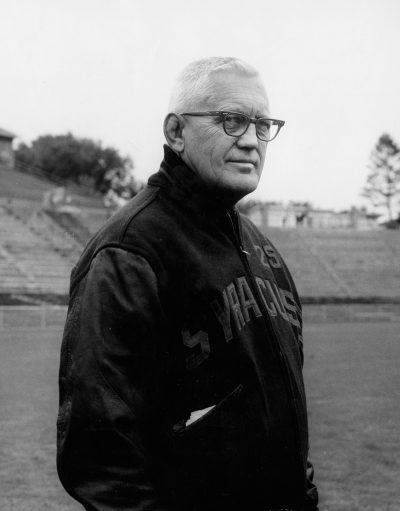 Dana Harrell moved to the Boston area, where he coached a Pop Warner football team. Alif Muhammad’s youngest son was one of his players. "We weren't talking about the Syracuse 8 stuff, that's 36 years ago," Dana says. "Our kids didn't even know anything about it. Nothing." But back in Syracuse, people had started talking about the events of 1970. Alumni and some of the Syracuse 8’s white teammates lobbied the university to make a formal apology. In 2006, the Syracuse 8 were invited back to receive the Chancellor’s Medal — the university’s highest honor — and their letterman’s jackets — a few sizes larger than they would have been in 1970. They handed the jackets out during halftime of a home game against Louisville. "They had us in the tunnel, and they wanted us, when they called our names, for us to run out of the tunnel, like we did in our playing days," Dana says. "And we looked at them like they were crazy. We don't have two good knees between us. But the satisfaction was immeasurable." Greg adds: "There were nothing but smiles and old men welling up in tears. I almost don't have the words to describe it. It was a cleansing, a lifting of this baggage that I had been carrying around for years to have someone finally acknowledge that, you know, we didn't do this to spite the university or hurt the university. We're trying to make the university and this world just a better place." 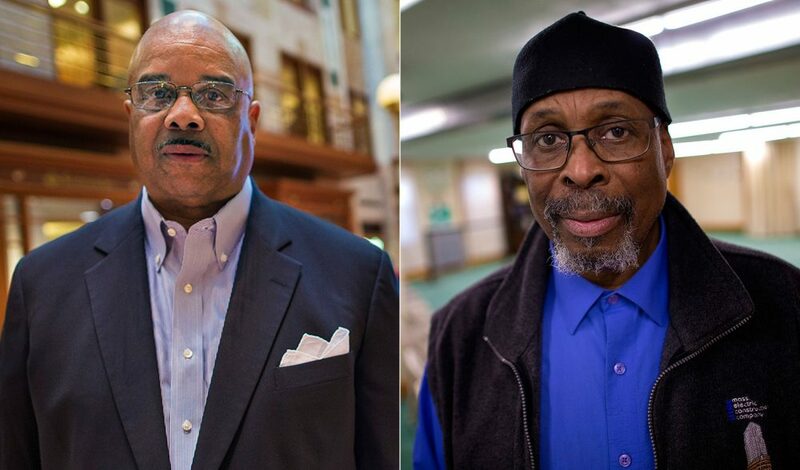 It took 36 years for the Syracuse 8 to meet again on that football field, instead of at Ben’s Kitchen -- 36 years for Syracuse to apologize and recognize the players were on the right side of history. So we asked Dana Harrell: How long before Colin Kaepernick's critics see him in a different light? Will someone someday ask him to run out on a football field in front of a cheering crowd? "I'm gonna answer that first with a quote," Dana says. "'The moral arc of the universe is long, but it bends towards justice.' Dr. King gave that answer when he was asked, how long did he think it would take for African-Americans to get full rights here in America? "And he said, 'How long? Not long.' So that's my answer." The nine members of the Syracuse 8 were Dana Harrell, Greg Allen, Alif Muhammad, John Lobon, Ronald Womack, Clarence McGill, Richard Bulls, John Godbolt and Duane Walker. 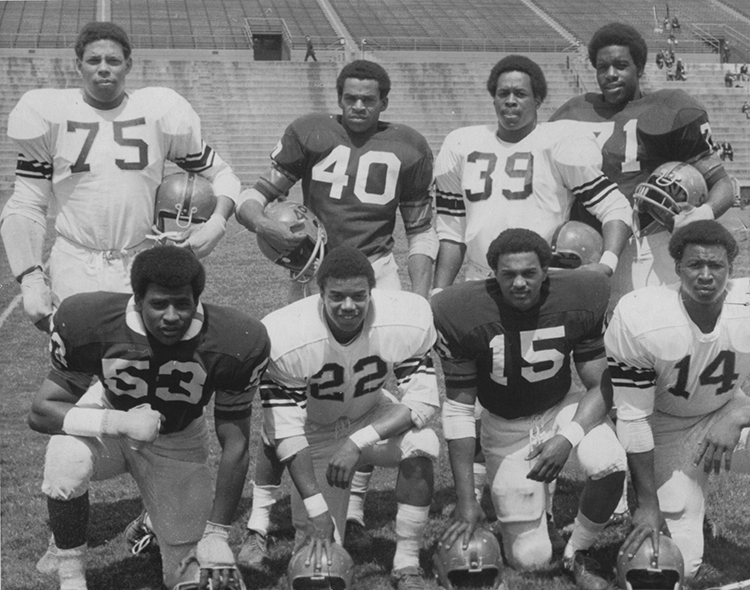 Read more about their stories in "Leveling the Playing Field: The Story of the Syracuse 8." This segment aired on November 18, 2017.